Here, we present a protocol to induce tolerance in transplantation, and assess in vitro and in vivo the suppressive capacity of distinct cell subsets from the recipient and the immune status of the recipient toward donor or exogenous antigens. Bézie, S., Usal, C., Guillonneau, C. In Vitro and In Vivo Assessment of T, B and Myeloid Cells Suppressive Activity and Humoral Responses from Transplant Recipients. J. Vis. Exp. (126), e55510, doi:10.3791/55510 (2017). The main concern in transplantation is to achieve specific tolerance through induction of regulatory cells. 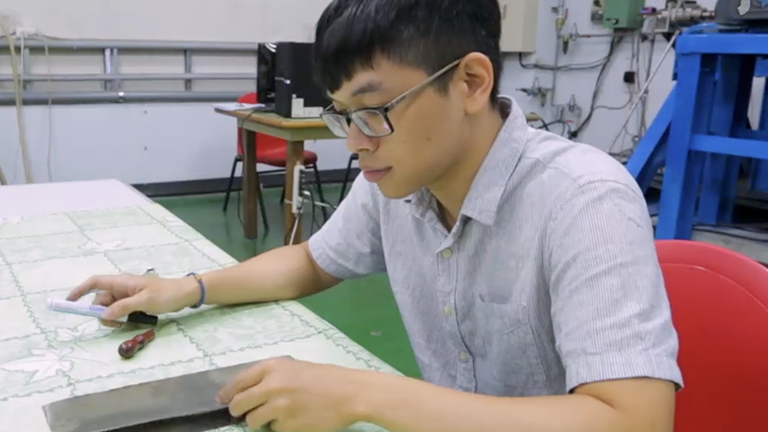 The understanding of tolerance mechanisms requires reliable models. Here, we describe models of tolerance to cardiac allograft in rat, induced by blockade of costimulation signals or by upregulation of immunoregulatory molecules through gene transfer. Each of these models allowed in vivo generation of regulatory cells such as regulatory T cells (Tregs), regulatory B cells (Bregs) or regulatory myeloid cells (RegMCs). In this manuscript, we describe two complementary protocols that have been used to identify and define in vitro and in vivo regulatory cell activity to determine their responsibility in tolerance induction and maintenance. First, an in vitro suppressive assay allowed rapid identification of cells with suppressive capacity on effector immune responses in a dose dependent manner, and can be used for further analysis such as cytokine measurement or cytotoxicity. Second, the adoptive transfer of cells from a tolerant treated recipient to a newly irradiated grafted recipient, highlighted the tolerogenic properties of these cells in controlling graft directed immune responses and/or converting new regulatory cells (termed infectious tolerance). These methods are not restricted to cells with known phenotypic markers and can be extended to any cell population. Furthermore, donor directed allospecificity of regulatory cells (an important goal in the field) can be assessed by using third party donor cells or graft either in vitro or in vivo. Finally, to determine the specific tolerogenic capacity of these regulatory cells, we provide protocols to assess the humoral anti-donor antibody responses and the capacity of the recipient to develop humoral responses against new or former known antigens. The models of tolerance described can be used to further characterize regulatory cells, to identify new biomarkers, and immunoregulatory molecules, and are adaptable to other transplantation models or autoimmune diseases in rodent or human. Cardiac allograft in rat is a reliable organ transplant model to assess tolerance induction treatments, to decipher the mechanisms of tolerance induction and maintenance, and has the potential to induce functionally competent and dominant regulatory cells. The protocols below describe a fully mismatch heterotopic cardiac graft from a Lewis 1W donor rat (LEW.1W, RT1u) into a Lewis 1A recipient rat (LEW.1A, RT1a). In this graft combination, acute rejection occurs rapidly (in about 7 days) and can be easily assessed by graft beating measurement through palpation of the abdomen. Here we propose three protocols to induce tolerance to the cardiac allograft in rat. In these models, tolerance is induced and/or maintained by different regulatory cell types. First, the blocking of CD40-CD40L interactions with an adenovirus encoding CD40Ig (AdCD40Ig) induced the generation of CD8+ Tregs capable of inducing tolerance when adoptively transferred to secondary grafted recipients1. Furthermore, depletion of CD8+ cells (with anti-CD8α antibodies) in AdCD40Ig-treated recipients generated Bregs and RegMCs2. Deep analysis of CD8+ Tregs properties highlighted the key role of several immunoregulatory molecules defined as interleukin-34 (IL-34) and Fibroleukin-2 (FGL-2)3,4,5,6. Whereas overexpression of IL-34 (with an AAV vector) induced Tregs through generation of RegMCs, overexpression of FGL-2 induced Bregs, underlying the complex network of regulatory cells. Because chronic rejection develops slowly and is long-term, an in-depth analysis is required to distinguish tolerance versus chronic rejection. Graft is usually assessed for cell infiltration, fibrosis, thickening of vascular wall and complement C4d deposition by immunohistology7. While histology methods require animal sacrifice or graft biopsy, here we describe a simple method to assess different features of tolerated allograft: the emergence and function of regulatory cells and the anti-donor specific antibody responses from blood sample by flow cytometry (here, we used fluorescence-activated cell sorting (FACS)). Maintenance of tolerance to the allograft after arrest of the treatment is generally associated with the induction of regulatory cells8. In the last decades, studies focused on CD4+ Tregs unanimously characterized them by the key markers Foxp3+, CD25high, and CD127-9,10,11. Similarly, several markers were attributed to CD8+ Tregs, like CD122+, CD28-, CD45RClow, PD1+, and Helios+1,12,13,14,15,16,17. Over the years, expression of GITR, CTLA4, and cytokines (IL-10, TGFβ, IL-34, IL-35, FGL-2) were additionally associated to a Treg profile3,4,6,13,18,19,20,21. However, emerging regulatory cell populations, such as Bregs, RegMCs, or NKTregs, lack relevant specific markers. Indeed, Bregs are mostly reported as immature CD24+ cells, with ambiguous CD27 expression and sometimes production of IL-10, TGFβ, or granzyme B22,23,24. The complexity of the myeloid cell lineage requires a combination of several markers to define their regulatory or proinflammatory profile such as CD14, CD16, CD80, CD86, CD40, CD209a, or CD16325,26. Finally, some markers have been reported to identify NKTregs such as CD11b+, CD27+, TGFβ+, but more studies are needed to further phenotypically describe them27,28,29,30,31,32. Thus, evidences of suppressive activity are required to legitimize further phenotypic description for the identification of new biomarkers, new immunoregulatory mediators, and to extend the scope to new cell therapies. We propose two complementary methods to evaluate the suppressive activity of cells. First, the in vitro method consists of culturing suppressive cells with labeled effector T cells stimulated by allogeneic donor antigen presenting cells (APCs) at different ratios over 6 days, and analyzing the effector T cell proliferation that reflects donor-directed immune suppression. Cells from treated rats can be compared directly to cells from naive rats and non-treated grafted rats for suppressive activity (or to any other regulatory cell population), in a range of suppressor:effector ratios. Furthermore, this method does not require any transplantation, and results are obtained within 6 days. Second, the in vivo method consists of transferring the intended regulatory cells from a treated rat to a newly irradiated grafted recipient. While B cells, myeloid cells or T cells from non-treated naive rats are usually unable to inhibit acute rejection and to prolong graft survival upon adoptive transfer, cells with potentiated suppressive activity from treated-recipients have these attributes1,2,3,4,33. Lymphopenia induced by irradiation of the recipient is recommended to allow adoptively transferred cells to remain unaffected by blood homeostasis and to master more easily the anti-donor immune responses. For both methods, the in vitro utilization of allogeneic third party APCs or in vivo adoptive transfer of suppressive cells into recipients grafted with a third-party heart allow analysis of the anti-donor specificity. Whereas the in vivo method requires a substantial number of cells, poorly represented cell subpopulations can be more easily assessed for suppressive activity in vitro33. Humoral responses can also be measured to assess the state of tolerance and the control of directed antibody responses to donor antigens. Indeed, tolerance can be characterized by the absence of humoral response toward the donor but conservation of the capacity for the recipients to develop humoral response to new antigens and preservation of memory responses. First, the principle of alloantibody detection is based on recognition of the donor cells by recipient antibodies following incubation of donor cell type with serum from a grafted recipient. Second, humoral responses directed to exogenous antigens can be assessed following stimulation of long-term tolerant recipients with Keyhole Limpet Hemocyanin (KLH) emulsified with complete Freund's adjuvant. The presence of specific IgM and IgG antibodies against antigens can be detected 4 and 13 days, respectively, following immunization, with Enzyme Linked ImmunoSorbent Assay (ELISA)34. Third, the preservation of immune memory responses can be assessed by injection of xenogeneic red blood cells (RBCs) at days -7 and +3 of transplantation and RBCs staining with recipient serum collected at days +8 and +17 following transplantation. All these methods allow for the identification of immunoglobulin subtypes by using specific secondary antibodies, and rapid acquisition of results in less than 1.5 h by FACS staining or a few hours by ELISA. Finally, these protocols are designed for characterization of transplantation models, and can be, to some extent, applied to autoimmune disease models. The principles of the method can be transposed to all species. Note: All protocols here have been approved by an ethical committee and should be performed in a sterile manner. Anesthetize a donor male LEW.1W rat using isoflurane-O2 inhalation, supplemented with 1% N2O after 5 min. Place the animal in dorsal decubitus, and disinfect the abdomen with betadine to perform a thoracotomy (i.e., incision into the pleural space of the chest). Clamp the inferior and superior venae cavae, ligature them, and cut them. Then cut the pulmonary artery and the aorta and save the graft in cold 0.9% NaCl. Anesthetize a 250 g male LEW.1A recipient rat (of 8-12 weeks) using isoflurane-O2 inhalation, supplemented with 1% N2O after 5 min. Place the animal in dorsal decubitus, and disinfect the abdomen with betadine to perform a xyphopubic laparotomy (i.e., large incision from the xiphoid process to pubic symphysis). Externalize the intestines, clamp the abdominal blood vessels, perform a termino-lateral anastomosis (i.e., connection between the end of one channel and the wall of the other) between the graft aorta and the abdominal aorta and between the pulmonary artery and the abdominal vena cava, and remove clamps. Suture the muscular plane and skin, and disinfect with betadine. Inject nalbuphine (analgesic) 6 mg/kg subcutaneously (s.c.) and oxytetracycline (antibiotic) intramuscularly (i.m. ), and place the animal under a heat lamp until the animal awakens. Inject buprenorphine (opioid) (50 µg/kg) i.m. and meloxicam (nonsteroidal anti-inflammatory drug) (0.3 mg/kg) s.c. the day of the transplantation and one day after. Follow steps 1.1.1. to 1.1.2. In a classified A2 area of the animal facility, dilute 2 x 1010 infectious particles of AdCD40Ig (an adenovirus encoding CD40Ig, a chimeric molecule that blocks the CD40-CD40L interactions) in Ringer's lactate solution to reach a final volume of 150 µL and inject in 3 points (3 x 50 µL) in the ventricular wall of the apex of the graft. Follow steps 1.1.3 to 1.1.4. NOTE: AdCD40Ig treatment can be associated with anti-CD8α, anti-ICOS, or anti-CD28 antibody injections2,35,36. Dilute 1 x 1012 viral genome of rat IL34-recombinant AAV in Ringer's lactate solution to reach a final volume of 100 µL. Anesthetize a 150 g LEW.1A rat with isoflurane-O2 inhalation and inject intravenously (i.v.) in the penile vein. One month following AAV-IL34 injection, perform a LEW.1W graft on the LEW.1A recipient according to protocol 1.1. Note: Suppressive activity of cells from treated tolerant rats should be compared with the equivalent population from syngeneic grafted recipients or naive rats. Anesthetize a male LEW.1W naive donor rat using isoflurane-O2 inhalation, supplemented with 1% N2O after 5 min. Place the animal in dorsal decubitus, and disinfect the abdomen with betadine to perform a splenectomy. Remove the spleen by transecting the vessels, save the spleen in cold 1X phosphate-buffered saline (PBS) and suture the animal. Transfer the spleen in a dish, remove 1X PBS and perfuse with 5 mL of 0.2% collagenase D. To improve the enzyme digestion, cut the spleen into small pieces and incubate 15 min at 37 °C. Add 500 µL of 0.1 M ethylenediaminetetraacetic acid (EDTA), transfer the spleen pieces into a sieve and crush the spleen with a syringe's piston to dissociate the cells. Transfer into a tube and wash the cells with 15 mL of 1X PBS. Centrifuge 10 min at 430 x g. Discard the supernatant. To eliminate RBCs and platelets, resuspend the splenocyte pellet in 10 mL hypotonic solution and incubate 5 min at room temperature (RT). Wash with 1X PBS and centrifuge 10 min at 190 x g. Discard the supernatant. Remove collagen fibers by filtering on a 100 µm tissue filter. Count the cells to adjust cell concentration to 5 x 107 cells/mL in 1X PBS/2% fetal calf serum (FCS)/0.5 mM EDTA. Note: The number of splenocytes should be between 4 x 108 and 7 x 108 cells. Enrich for cells of interest by negative selection before cell sorting. Incubate 15 min at 4 °C with 2 µg/mL purified antibodies specific to T cells (anti-TCRαβ, R7/3 clone, and anti-TCRγδ, V65 clone), B cells (anti-CD45RA, OX33 clone), and NK cells (anti CD161, 3.2.3 clone), wash with 1X PBS/2% FCS/0.5 mM EDTA and centrifuge 10 min at 430 x g. Discard the supernatant. Wash with magnetic beads 3 times with 1X PBS/2% FCS/0.5 mM EDTA. Use 3.5 µL beads/106 splenocytes, wash by adding 30 mL 1X PBS/2% FCS/0.5 mM EDTA, place for 1 min on the magnet, and discard the supernatant. Repeat twice. Resuspend the beads in 10 volumes of 1X PBS/2% FCS/0.5 mM EDTA (for example, 35 µL beads is diluted in 350 µL 1X PBS/2% FCS/0.5 mM EDTA). Remove unwanted cells by mixing the splenocytes with the magnetic beads for 10 min at 4 °C under agitation, place the tube on the magnet for 1 min and transfer the supernatant to a new tube. Repeat twice. Count the cells and adjust the cell concentration to 5 x 107 cells/mL in 1X PBS/2% FCS/0.5 mM EDTA. NOTE: The enriched splenocytes number should range between 5 x 107 and 9 x 107. 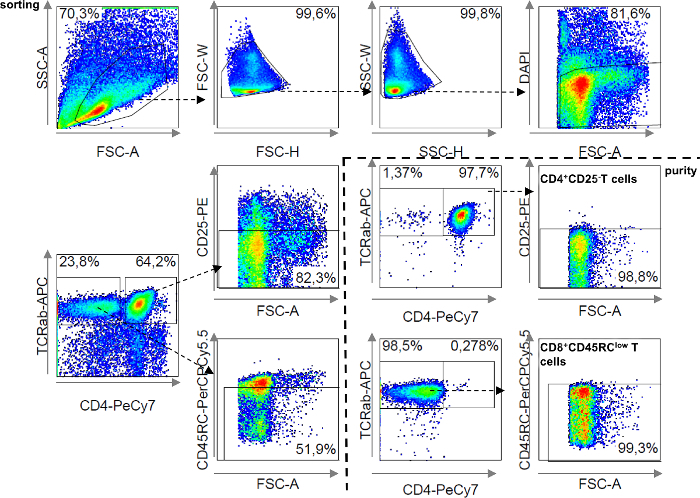 Stain the cells using labeled antibodies for further sorting of pDCs: exclude remaining T cells (anti-TCRαβ, R7/3 clone) or B cells (anti-CD45RA, OX33 clone), and sort CD4+ (anti-CD4, OX35 clone) CD45R+ cells (anti-CD45R, His24 clone). Label beads with each Ab to establish a compensation matrix on FACS. Incubate 15 min at 4 °C and wash with 1X PBS/2% FCS/0.5 mM EDTA. Resuspend the cells at a concentration of 5 x 107 cells/mL, filter on a 60 µm tissue filter, and label dead cells by adding DAPI at a final concentration of 0.1 µg/mL. Sort cells with a 70 µm nozzle cell sorter, by gating on DAPI-TCR-CD45RA-CD4+CD45R+ as shown in Figure 1. Harvest the spleen from a non-treated non-grafted naive LEW.1A rat and save it in cold 1X PBS. Transfer the spleen in a sieve placed in a dish and add 10 mL of 1X PBS. Crush the spleen with a syringe's piston to dissociate the cells. Transfer the cells into a 50 mL tube, wash with 1X PBS and centrifuge 10 min at 430 x g. Discard the supernatant. To eliminate RBCs and platelets, resuspend the splenocyte pellet in 10 mL hypotonic solution for 5 min at RT, then wash in 1X PBS and centrifuge at 10 min 190 x g. Discard the supernatant. Remove the collagen fibers by filtering on a 100 µm tissue filter. Count the cells to adjust the cell concentration to 5 x 107 cells/mL in 1X PBS/2% FCS/0.5 mM EDTA. NOTE: The number of splenocytes should be between 3 x 108 and 5 x 108 cells. Enrich the cells of interest before sorting. Incubate 15 min at 4 °C with 2 µg/mL purified antibodies specific to CD8 cells (anti-CD8α, OX8 clone), B cells (anti-CD45RA, OX33 clone), NK cells (anti CD161, 3.2.3 clone), myeloid cells (anti-CD11b/c, OX42 clone), gamma delta T cells (anti-TCRγδ, V65 clone). Then wash with 1X PBS/2% FCS/0.5 mM EDTA and centrifuge 10 min at 430 x g. Discard the supernatant. NOTE: To sort natural CD8+ Tregs from naive rats at the same time as CD4+ effector T cells, do not add anti-CD8α Ab during the depletion. Wash the magnetic beads 3 times with 1X PBS/2% FCS/0.5 mM EDTA as described in step 2.1.7. Remove the unwanted cells by mixing splenocytes with the magnetic beads for 10 min at 4 °C under agitation, then place the tube on the magnet for 1 min and transfer the supernatant to a new tube. Repeat twice. Count the cells and adjust the cell concentration to 5 x 107 cells/mL in 1X PBS/2% FCS/0.5 mM EDTA. NOTE: The splenocytes number should range between 5 x 107 and 8 x 107 cells. Add labeled antibodies to sort CD4+CD25- T cells: anti-TCRαβ (R7/3 clone), anti CD4 (OX35 clone), anti-CD25 (OX39 clone) and incubate 15 min at 4 °C. To simultaneously sort CD8+CD45RClow Tregs, add anti-CD45RC Ab (OX22 clone). Label beads with each Ab to set up a compensation matrix for further processing on flow cytometry. Wash the cells with 1X PBS/2% FCS/0.5 mM EDTA and discard the supernatant. Resuspend cells to 5 x 107 cells/mL, filter on a 60 µm tissue filter, and label dead cells by adding DAPI at a final concentration of 0.1 µg/mL. Sort the cells with a 70 µm nozzle cell sorter by gating on DAPI -TCR+CD4+CD25- cells as responder cells (and if needed DAPI -TCR+CD4-CD45RClow as CD8+ Tregs suppressive cells) as shown in Figure 2. Note: Divide the spleen in two aliquots: sort one on B cells, myeloid cells, and NK cells, and the other on CD4+ and CD8+ CD45RClow T cells, to assess their suppressive function. NOTE: For adoptive cell transfer, save 1 x 108 splenocytes to serve as the positive control of tolerance by adoptive transfer, if needed. Follow protocol 2.1.1 to 2.1.5. Incubate 15 min at 4 °C with 2 µg/mL T cell-specific unlabeled antibodies (anti-TCRαβ, R7/3 clone, and anti-TCRγδ, V65 clone), wash with 1X PBS/2% FCS/0.5 mM EDTA and centrifuge 10 min at 430 x g. Discard the supernatant. Wash with magnetic beads 3 times with 1X PBS/2% FCS/0.5 mM EDTA as described in step 2.1.7. Mix the splenocytes with the magnetic beads to remove unwanted cells and incubate for 10 min at 4 °C under agitation, then place the tube on the magnet for 1 min and transfer the supernatant to a new tube. Repeat twice. Count the cells and adjust the cell concentration to 5 x 107 cells/mL in 1X PBS/2% FCS/0.5 mM EDTA. Add labeled antibodies to the splenocytes to sort cells with suspected suppressive activity such as myeloid cells (anti-CD11b/c, OX42 clone), B cells (anti-CD45RA, OX33 clone), or NK cells (anti-CD161, 3.2.3 clone). Label the beads with each Ab to establish a compensation matrix on FACS. Incubate 15 min at 4 °C and wash with 1X PBS/2% FCS/0.5 mM EDTA. Resuspend the cells at a concentration of 5 x 107 cells/mL, filter on a 60 µm tissue filter, and label dead cells by adding DAPI at a final concentration of 0.1 µg/mL. 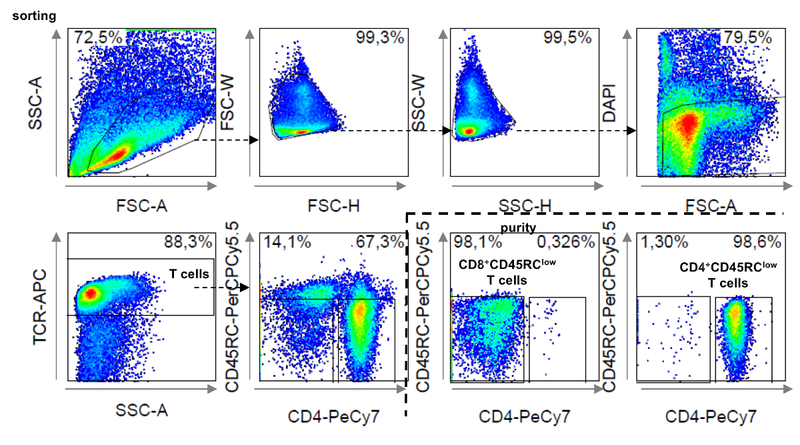 Sort the cells with a 70 µm nozzle cell sorter by gating on DAPI-CD11b/c+ for myeloid cells, CD45RA+ for B cells, and CD161+ for NK cells as shown in Figure 3. Follow protocol 2.2.1 to 2.2.4. For negative selection on a magnetic column, incubate the cells 15 min at 4 °C with 2 µg/mL purified antibodies specific to B cells (anti-CD45RA, OX33 clone), NK cells (anti CD161, 3.2.3 clone), myeloid cells (anti-CD11b/c, OX42 clone), gamma delta T cells (anti-TCRγδ, V65 clone), wash them with 1X PBS/2% FCS/0.5 mM EDTA and centrifuge 10 min at 430 x g. Discard the supernatant. Remove the unwanted cells by mixing the splenocytes with the magnetic beads for 10 min at 4 °C under agitation, then place the tube on the magnet for 1 min and transfer the supernatant to a new tube. Repeat twice. Count the cells and adjust the cell concentration to 5 x 107 cells/mL in 1X PBS/2% FCS/0.5 mM EDTA. Add labeled antibodies to the cells to sort Tregs: anti-TCRαβ (R7/3 clone), anti-CD4 (OX35 clone), anti-CD45RC (OX22 clone). Label the beads with each Ab to establish a compensation matrix on FACS. Incubate 15 min at 4 °C and wash with 1X PBS/2% FCS/0.5 mM EDTA. Resuspend the cells at a concentration of 5 x 107 cells/mL, filter on a 60 µm tissue, and label dead cells by adding DAPI at a final concentration of 0.1 µg/mL. Sort the cells with a 70 µm nozzle cell sorter by gating on DAPI -TCR+CD4+CD45RClow as CD4+ Tregs and DAPI -TCR+CD4-CD45RClow as CD8+ Tregs ( Figure 4). NOTE: The anti-CD8α Ab (OX8 clone) can be used instead of the anti-CD4 Ab if T cells are discriminated from CD4+ non-T cells by anti-TCR labeling. An excess of CD4+ Tregs should be sorted in anticipation of cell death due to the Cell Proliferation Dye (CPD) labeling. After responder cell sorting, wash twice the cells with 1X PBS. Resuspend the cells at a concentration of 1 x 107 cells/mL in 1X PBS and incubate with 0.5 µM CFSE for 5 min at RT in the dark. Stop the reaction by adding FCS at 1.5X the volume and centrifuge 10 min at 430 x g at 4 °C. Discard the supernatant. Wash twice the cells with complete medium, and count the cells. Note: Expect 30% of cells death at this step. NOTE: This step is required to discriminate CFSE-CD4+ Tregs from CFSE- proliferating responder CD4+ T cells at day 6 of coculture by gating on CPD- cells. After CD4+ Tregs cell sorting, wash twice the cells with 1X PBS. Resuspend the cells at a concentration of 1 x 107 cells/mL in 1X PBS and incubate with 10 µM of CPD V450 for 20 min at RT in the dark. Use culture in medium comprising: RPMI 1640 medium supplemented with beta-mercaptoethanol (5 x 10-5 M), penicillin (100 U/mL), streptomycin (0.1 mg/mL), sodium pyruvate (1 mM), glutamine (2 mM), HEPES buffer (1 mM), non-essential amino acids (1X), FCS (10%). Culture cells in 96-well U bottom plates. Add cells in the following order: suppressive cells, responder cells, and allogeneic cells. Keep constant the number of responder T cells and allogeneic APCs and test a range of Tregs number. For example, ratio 4:4:1, 5 x 104 suppressive cells, 5 x 104 responder cells, and 1.25 x 104 allogeneic cells, and ratio 2:4:1, 2.5 x 104 suppressive cells, 5 x 104 responder cells, and 1.25 x 104 allogeneic cells. Maintain the proportion of 5 x 104 responder cells for 200 µL medium/well. For controls, include a few wells with responder T cells without allogeneic APCs (negative control) and responder T cells with allogeneic APCs without regulatory cells (positive control) for CFSE gating at day 6 (see step 2.7.6.). NOTE: The proliferation of effector cells can be assessed at several time points. Note that proliferation is exponential: as cell division increases, more differences between the suppressive conditions and negative control can be observed. Transfer the cells from the 96-well U bottom plates to 96-well V bottom plates and centrifuge 1 min at 1,200 x g at 4 °C. Save the supernatant in a new plate at -20 °C for measuring cytokine levels, if needed. Wash the cells with 200 µL 1X PBS/2% FCS/0.5 mM EDTA per well and centrifuge 1 min at 1,200 x g at 4 °C. Add antibodies to the cells to further gate on responder T cells: anti-TCRab (R7/3 clone) and anti-CD4 (OX35 clone). Incubate 15 min at 4 °C and wash twice with 200 µL 1X PBS/2% FCS/0.5 mM EDTA per well. Discard the supernatant. Add 100 µL of DAPI diluted at 0.1 µg/mL in 1X PBS and read the plate with a FACS analyzer. 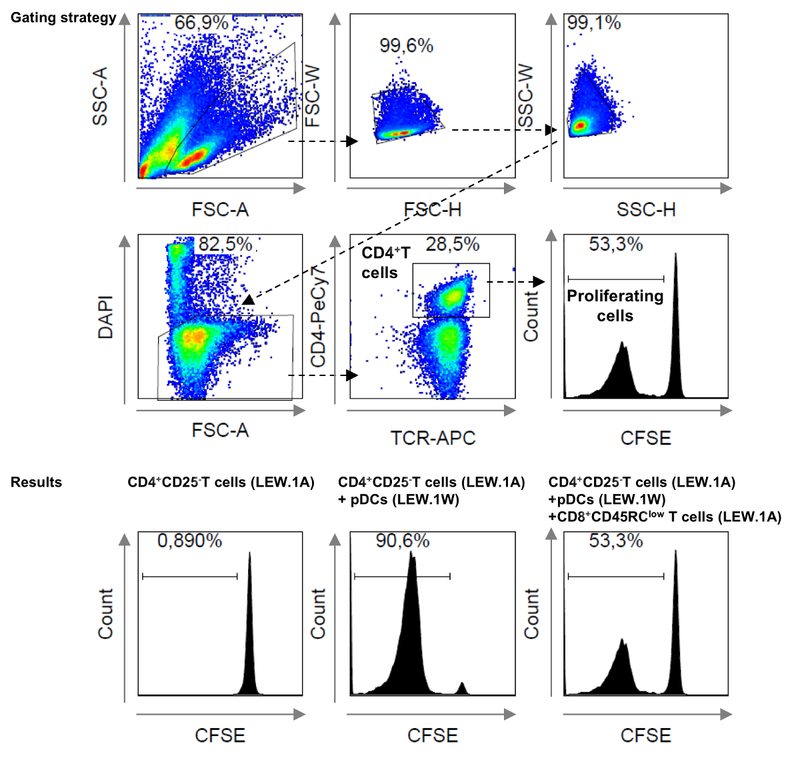 Analyze the CFSE profile by gating on DAPI negative (live cells) CPD negative (non-CD4+ Tregs) TCR+CD4+ cells. Unstimulated responder cells have maximal CFSE brightness as shown in Figure 5 bottom left histogram. In the presence of allogeneic APCs, the responder cells have maximal proliferation and minimal CFSE brightness (bottom, middle). In the presence of allogeneic APCs and regulatory cells, the effector cells have medium proliferation and CFSE brightness (bottom, right). NOTE: Irradiation is needed to eliminate the host cells and favor donor cell engraftment and proliferation. Irradiate the graft recipients early on the day before the graft to precondition the recipient. Anesthetize rats with i.m. injection of xylazine (8 mg/kg)-ketamine (80 mg/kg) and irradiate them at a dose of 4.5 Gy with X rays. Follow protocol 2.3 to isolate cells of interest. NOTE: Save 1 x 108 splenocytes to serve as a positive control of tolerance by adoptive transfer, if needed. 12 h after irradiation (the day before the graft, in the evening), anesthetize the rats by inhalation of 4% isoflurane-O2 and infuse the cells (5.0 x 107 T cells, 3.0 x 107 B cells, 3.0 x 107 myeloid cells, or 1.50 x 108 splenocytes as the positive control of tolerance by adoptive transfer) i.v. in the penile vein. NOTE: The number of cells required for tolerance by adoptive transfer depends on the suppressive activity of the cells. The next day, follow protocol 1.1 to perform the allograft. Follow graft evolution by palpation through the abdomen. NOTE: IgG responses directed toward the graft donor are measured by incubating the cells from the donor with serum of the recipient. Subtract the background induced by direct staining of LEW.1W B cells by incubating the cells with syngeneic LEW.1W serum. Harvest blood from the rats and centrifuge 15 min at 1,200 x g at 4 °C. Save the serum. Serum can be stored at -20 °C or used immediately. Inactivate the complement in the sera by incubating for 30 min at 56 °C. Harvest the spleen from a donor LEW.1W rat and save it in cold 1X PBS. Follow the steps 2.2.1. to 2.2.4. Add 2 x 105 cells/well in a 96-well V bottom plate. Centrifuge 1 min at 1,200 x g at 4 °C and discard the supernatant. Dilute the sera serially from 1/10 to 1/270 in 1X PBS (4 dilutions/sample). Incubate the cells for 1 h at 4 °C with 25 µL of diluted serum/well. Anticipate the number of donor-specific IgG subtypes (IgG, IgG1, IgG2a, IgG2b) immune responses to analyze per sample (1 serum x 4 dilutions x 4 IgG subtypes). Wash the cells with 1X PBS/2% FCS/0.5 mM EDTA and discard the supernatant. Incubate the cells with each mouse anti-rat IgG subtype Ab fluorochrome-labeled for 30 min at 4 °C, one subtype/well. Note: If fluorochrome-labeled anti-rat Ig Ab are unavailable, it is possible to use purified unlabeled mouse anti-rat IgG subtype Ab and a fluorochrome-labeled secondary anti-mouse Ab. Depending on the available fluorochromes and cytometer configuration, several anti-rat IgG subtypes can be tested in one well with appropriate settings. Wash the cells with 1X PBS/2% FCS/0.5 mM EDTA twice and discard the supernatant. Add 100 µL of DAPI diluted at 0.1 µg/mL in PBS and read the plate with a FACS analyzer. Read the mean fluorescence intensity (MFI) of anti-rat IgG subtype Ab labeled with fluorochrome on all DAPI- cells. Subtract the MFI obtained with naive LEW.1A serum on the LEW.1W cells (background staining, bottom left) from the MFI obtained with the sera from each recipient on the LEW.1W cells at the corresponding dilution (bottom middle for untreated rejecting recipients that display maximal MFI and bottom right for treated tolerant recipients that display intermediate MFI) (Figure 6). NOTE: Serum from rats before transplantation, treatment, and immunization should be used as negative controls of humoral responses. Otherwise, non-immunized naive rats can be used. Serum from immunocompetent recipients, i.e., transplanted exoantigen-immunized and rejecting recipients, are used as positive controls of humoral responses. NOTE: This method is a relative quantification of humoral responses as it does not include a standard. An absolute Ig quantification would be possible by adding a range of dilutions of rat IgG or IgM anti-KLH Ab with known concentration in step 5.1.6. 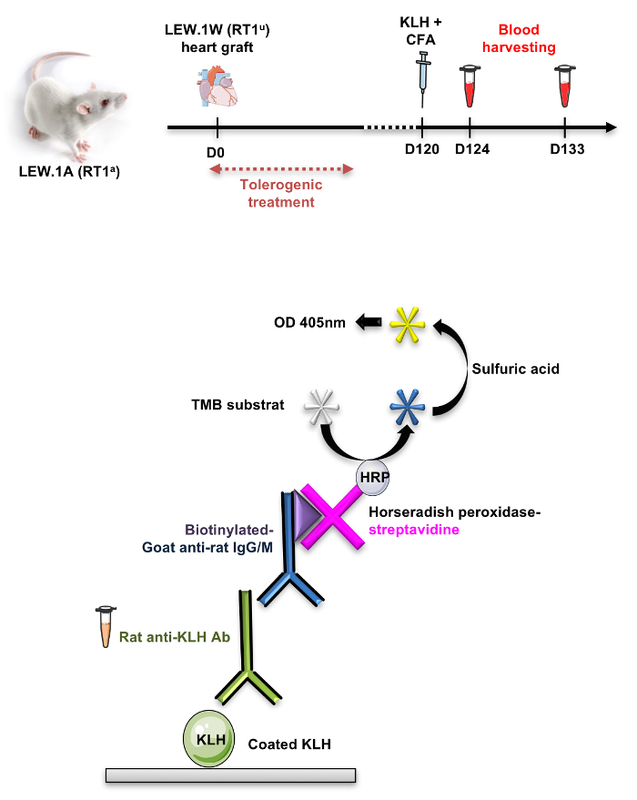 Emulsify 50 µg of KLH in 200 µL of complete Freund's adjuvant and inject in the tail of long-surviving/tolerant recipients, control untreated rejecting recipients, or naive rats as positive control of humoral responses. Harvest blood samples at 4 and 13 days after immunization, and centrifuge 15 min at 1,200 x g at 4 °C. Save the upper phase that is the serum. Harvest the serum from non-immunized rats for a negative control. Serum can be frozen at -20 °C until the ELISA assay. Coat ELISA plates (flat bottom) with 50 µL/well KLH diluted at 10 µg/mL in 1X PBS overnight at 4 °C. Make sure the coating solution covers all the wells. Remove the excess uncoated KLH by washing. To wash, add 150 µL/well of wash buffer (1X PBS containing 0.1% Tween) and flick. Block unspecific binding of recipient's Ig by incubating for 1 h at 37 °C with 100 µL/well of wash buffer containing 10% FCS. Wash once. Serially dilute the recipient sera in wash buffer starting from 1/40 to 1/512, add 50 µL/well in duplicates of the serial dilution to the coated plate, and incubate for 2 h at 37 °C. Keep some wells free of serum for a negative control. Wash twice. Add 50 µL of 1 µg/mL of biotin-conjugated anti-rat IgM Ab in wells containing the serum harvested at day 4 in recipients, or 50 µL of biotin-conjugated anti-rat IgG in wells containing the serum harvested at day 13, and incubate 1 h at 37 °C. Wash twice. Add 50 µL/well of HRP-conjugated streptavidin at 1 µg/mL for 45 min at 37 °C. Wash 3 times. Add 50 µL of 3,3′,5,5′-Tetramethylbenzidine (TMB) substrate for < 30 min at RT and stop the reaction with 25 µL of 2 M sulfuric acid when positive controls are saturated. Read the absorbance at 405 nm. Compare the optical density obtained with the recipient's serum to the one obtained with the naive rat control serum. 7 days before transplantation, inject i.v. 109 of xenogeneic RBCs diluted in 800 µL of 1X PBS into the naive rats. RBCs can be from sheep, horse or any other species. Perform the transplantation and administer the tolerogenic treatment. 3 days after the graft, inject again i.v.109 RBC diluted in 800 µL of 1X PBS in the graft recipients and non-grafted rats. Harvest blood samples 5 and 14 days after the second immunization and centrifuge 15 min at 1,200 x g at 4 °C to recover the upper serum phase. Serum can be stored at -20 °C or used immediately. Inactivate the complement in rat sera by incubating 30 min at 56 °C before use. Add 2 x 105 RBC/well of a 96-well V bottom plate. Centrifuge 1 min at 1,200 x g at 4 °C and discard the supernatant carefully by aspiration. Serially dilute the sera 2-fold from 1/10 to 1/1280 in 1X PBS (8 dilutions/sample). Incubate the cells for 1 h at 4 °C with 25 µL of diluted serum/well. Wash the cells with 1X PBS/2% FCS/0.5 mM EDTA and discard the supernatant. Incubate the cells with the RBC species-adsorbed anti-rat IgG or IgM subtypes labeled with fluorochrome for 30 min at 4 °C, one subtype/well. Assess the rat IgM and IgG anti-RBC in serum harvested 5 and 14 days after immunization, respectively. Wash the cells with 1X PBS/2% FCS/0.5 mM EDTA twice and discard the supernatant. NOTE: If fluorochrome-labeled anti-rat Ig Ab are unavailable, it is possible to use purified unlabeled mouse anti-rat IgG subtype Ab and a fluorochrome-labeled secondary anti-mouse Ab. Add 100 µL of DAPI diluted at 0.1 µg/mL in 1X PBS and analyze the cells with a FACS analyzer. Represent the MFI as a function of the dilution for each group. 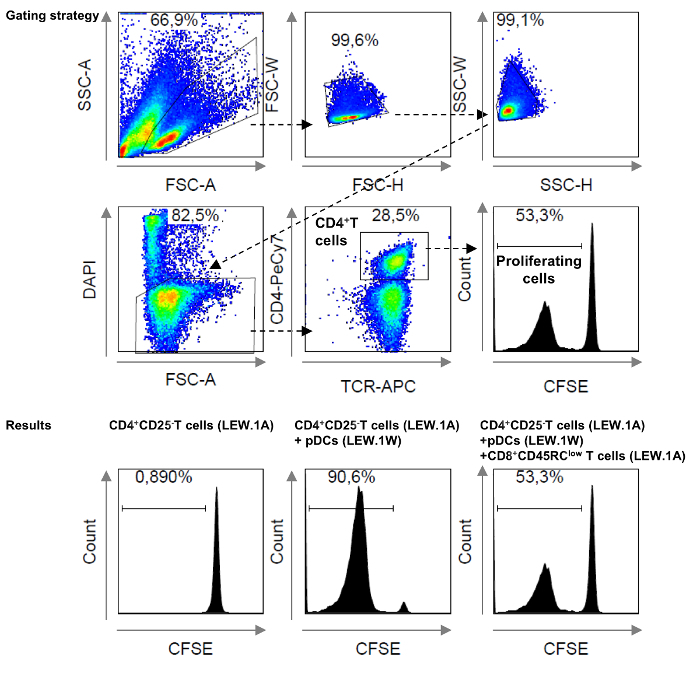 The assessment of suppressive activity following sorting of the APCs (Figure 1), responder cells and Tregs simultaneously (Figure 2), or individually (Figure 4), and any other putative regulatory cells (Figure 3), can be done in vivo by direct injection of the regulatory cells and in vitro by measurement of CFSE brightness (Figure 5). The status of the humoral response of the recipient toward the donor (Figure 6) or exogenous antigens (Figures 7 and 8) can also be assessed in vitro following in vivo immunization as depicted. Figure 1. Gating strategy to sort pDCs. 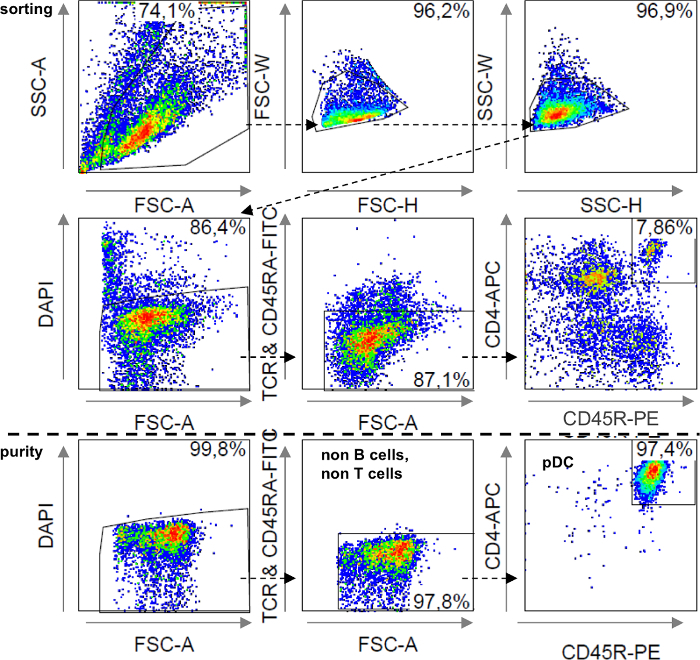 Cells were selected on morphology size and granularity (SSC-A/FSC-A), doublets were excluded by FSC-W/FSC-H and SSC-W/SSC-H parameters, live cells were selected by gating on DAPI- cells, and pDCs were selected on TCR-CD45RA-CD4+CD45R+ expression. Purity was assessed by adding DAPI to sorted cells and running on the cell sorter with the sorting parameters. Purity of a rare sorted population (less than 2%) should be greater than 95%. Please click here to view a larger version of this figure. Figure 2. Gating strategy to sort CD4+CD25- responder T cells and CD8+CD45RClow Tregs. Cells were selected on morphology, i.e., size and granularity (SSC-A/FSC-A), doublets were excluded by FSC-W/FSC-H and SSC-W/SSC-H parameters, live cells were selected by gating on DAPI- cells, and responder cells were selected on TCR+CD4+CD25- expression. CD8+ Tregs have been simultaneously sorted by gating on TCR+CD4-CD45RClow cells. Purity was assessed by adding DAPI to sorted cells and running on the cell sorter with the sorting parameters. Purity should be greater than 95%. Please click here to view a larger version of this figure. Figure 3: Gating strategy to sort B cells, myeloid cells, and NK cells. Cells were selected on morphology size and granularity (SSC-A/FSC-A), doublets were excluded by FSC-W/FSC-H and SSC-W/SSC-H parameters, living cells were selected by gating on DAPI- cells, and B cells were selected on CD45RA+ expression, myeloid cells on CD11b/c+ expression, and NK cells on CD45RA-CD11b/c-CD161high expression. Purity was assessed by adding DAPI to sorted cells and running on the cell sorter with the sorting parameters. Purity should be greater than 95%. Please click here to view a larger version of this figure. Figure 4. Gating strategy to sort CD8+CD45RClow and CD4+CD45RClow Tregs. Cells were selected on morphology size and granularity (SSC-A/FSC-A), doublets were excluded by FSC-W/FSC-H and SSC-W/SSC-H parameters, lived cells were selected by gating on DAPI- cells, and CD4+ Tregs were selected on TCR+CD4+CD45RClow expression and CD8+ Tregs on TCR+CD4-CD45RClow expression. Purity was assessed by adding DAPI to sorted cells and running on the cell sorter with the sorting parameters. Purity should be greater than 95%. Please click here to view a larger version of this figure. Figure 5. Representative analysis of the in vitro suppressive assay. The responder cell proliferation was analyzed by selection on morphology size and granularity (SSC-A/FSC-A), exclusion of doublets by FSC-W/FSC-H and SSC-W/SSC-H parameters, exclusion of dead cells and CD4+ Tregs by gating on DAPI-CPDV450- cells, selection of TCR+CD4+ cells, and CFSE profile analysis. The CFSE gate was based on unstimulated CFSE-labeled responder cells. CFSEhigh cells are non-proliferating cells and CFSElow are cells with ≥ 1 division. Please click here to view a larger version of this figure. Figure 6. Representative analysis of the donor specific alloantibody response. Splenocytes from the donor rat were incubated with a range of diluted heat-inactivated serum from treated or untreated recipients or from naive rat, and then with anti-rat IgG-FITC. 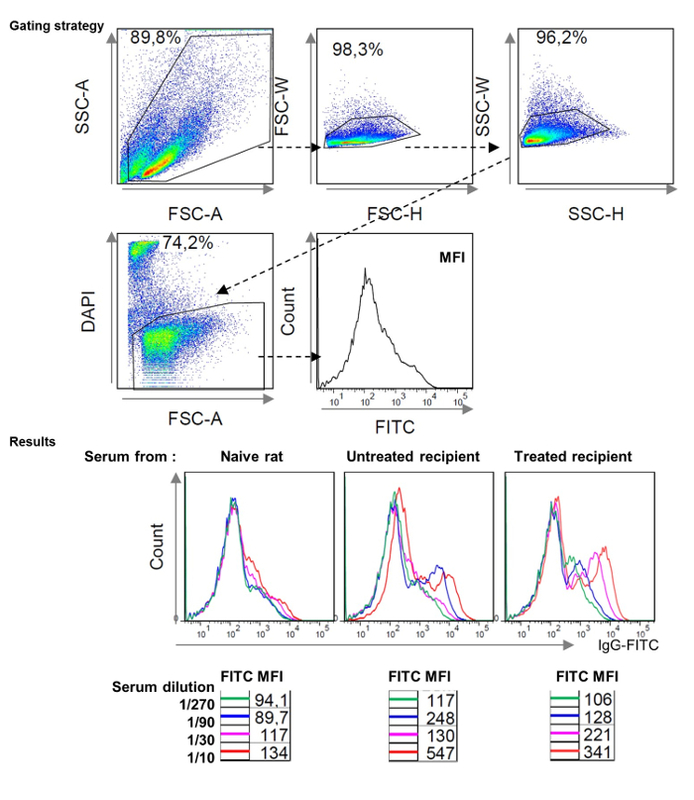 Alloantibodies are detected by analyzing MFI of the FITC on DAPI- z cells after SSC and FSC doublets exclusion. Please click here to view a larger version of this figure. Figure 7. Principle of the anti-KLH detection method. Recipients were immunized 120 days after transplantation with KLH supplemented with CFA, and blood samples were harvested 4 and 13 days after immunization. KLH proteins were coated on 96-flat bottom wells plates, and incubated with serum samples from immunized rats. Biotinylated goat anti-rat IgG or IgM allowed detection of anti-KLH Ab present in serum harvested 4 or 13 days after immunization. HRP-coupled streptavidin transformed the TMB substrate to a blue colored product that turns yellow when the reaction was stopped with sulfuric acid. Please click here to view a larger version of this figure. Figure 8. Scheme of the anti-RBC detection method. Recipients were immunized 7 days before and 3 days after transplantation with xenogeneic red blood cells (RBCs), and blood samples were harvested from immunized recipients 5 and 14 days after the last immunization. RBCs were incubated with serum samples from immunized rats. Presence of anti-RBCs antibodies on the RBCs was detected by staining with labeled goat anti-rat IgG or IgM antibodies and FACS Canto analysis. Please click here to view a larger version of this figure. Adoptive transfer of total splenocytes into a newly grafted recipient is an efficient way to detect the presence of regulatory cells induced or potentiated by a treatment. Host irradiation-induced transient lymphopenia promotes cell survival after transfer and establishment of tolerance. Moreover, sub-lethal irradiation leaves time for cells with tolerogenic properties to convert to new regulatory cells during immune reconstitution, a phenomenon called infectious tolerance34. Usually, well-described CD4+CD25highFoxp3+CD127low Tregs are first studied when tolerance is observed. However, transfer of the negative fraction (splenocytes depleted in CD4+ Tregs) allows sometimes extension beyond the already known regulatory cells and identification of new cell populations1,2,3,4. In AdCD40Ig-induced tolerance, the transfer of CD4+ T cells-depleted splenocytes revealed the discovery of CD8+CD45RClow Tregs1. Furthermore, successive transfer of total CD8+ T cells, and then restricted to CD45RClow cells, showed the potential of such a method to progressively identify a new population of regulatory cells. Moreover, this strategy allows analysis of all populations. Indeed, we have shown that many regulatory cells can coexist and are even probable, and that compensatory mechanisms exists2,4. 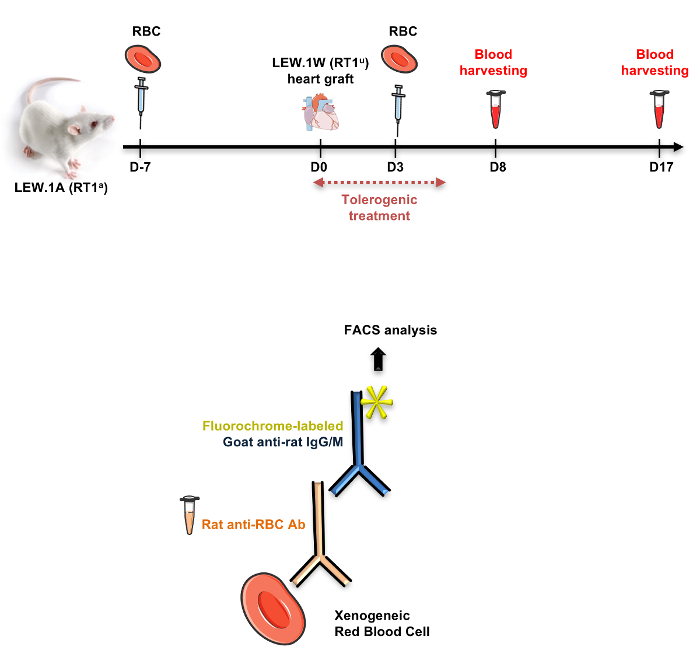 In rats treated with CD40Ig, depletion of CD8+ cells allowed the emergence of B cells and myeloid cells with regulatory properties, and transferred tolerance to the cardiac allograft in rat according to the protocol described above2. In a model of tolerance induced by overexpression of IL34, both CD4+ and CD8+Tregs were able to transfer tolerance4. Donor-directed specificity of treatment-induced tolerance can be assessed at cellular and humoral levels. First, adoptive transfer of regulatory cells into recipients of a third party graft will not succeed in transferring tolerance if the cells are specific to the first donor graft33. Second, suppressive cells should efficiently inhibit the proliferation of responder cells in response to stimulation by the APCs from the first donor of the graft but not from a third party donor2. Finally, humoral responses against the donor of the graft can be distinguished from total Ig production in the recipient by using the protocol described above. Furthermore, in a case of tolerance specific to the first graft donor, recipient should be able to develop a new humoral response against a secondary third-party graft, a new antigen, or a former known antigen16. Collagenase D treatment of the spleen is preferred and advisable to extract all cell populations from the organ. Finally, when the phenotype of regulatory cells is so tight that the cells are poorly represented (< 1% of splenocytes), transfer of the negative fraction compared to the transfer of the total population can help distinguish the suppressive activity of this small population. For example, CD40Ig-induced CD8+ Tregs specific to an allogeneic peptide could be FACS stained using tetramers but their low number did not allow positive adoptive transfer33,38. However, adoptive transfer of the tetramer-depleted CD8+CD45RClow T cells did not transfer tolerance compared to total Tregs, highlighting the potential of this subpopulation. This result was confirmed by an in vitro suppressive experiment. Indeed, the suppressive experiment was also a convincing way to show the capacity of Du51-specific Tregs to suppress immune responses33. The suppressive protocol described above is restricted to recipient effector CD4+ T cell responses to pDCs from the donor. This protocol can be adapted by replacing pDCs by cDCs or total APCs, but ensuring that the effector:stimulator ratios are appropriate to achieve a moderate proliferation manageable by the suppressive cells. Indeed, a ratio of CD4+CD25-T cells:pDCs should be 4:1, whereas a ratio of CD4+CD25- T cells:cDCs should be 8:1, and CD4+CD25- T cells:APCs, 1:1 or 1:2. The ratios depend on the alloreactivity between the donor and recipient; the above ratios are appropriate for a LEW.1W:LEW.1A combination with an acute rejection occurring at day 7, but the range of responder:stimulator ratios should be tested before the sacrifice of animals. Finally, CFSE is preferred to thymidine to analyze suppressive activity, for safety and reliability concerns. However, ensure the possible distinction between suppressive cells and responder cells for the CFSE analysis at day 6 if the effector CD4+CD25- T cells are replaced by total splenocytes. Similarly, ensure that the remaining T cells among stimulator cells cannot proliferate following 35 Gy irradiation. Design of the FACS staining is based on the availability of antibodies listed in Table 3. Similar protocols can be adapted for mice models, ensuring target denomination (for example myeloid cells are differentially described in mouse and rat). The heterotopic cardiac allograft in rat is a solid organ transplantation model with great opportunities for graft outcome monitoring. While renal allograft model are characterized by a sudden death of the recipient, palpation of the beat strength of the cardiac graft through the abdominal wall informs of the graft evolution39,40. A concomitant skin graft or a second cardiac graft can be realized on the cardiac allograft recipient to study memory responses41. Furthermore, biomolecular engineering and biological or chemical tools for depletion of specific cell types like B cells (IgM KO), CD8 cells (anti-CD8α antibodies), or myeloid cells (clodronate liposomes), are useful tools to measure the importance of such cell populations in induction or maintenance of the tolerance depending on the time post transplantation where depleting treatment is administered to the recipient1,2,3,4. To date, rat Bregs, myeloid cells, and CD8+ Tregs are not well described. The protocols of tolerance induction above are proposed as reference for the characterization of rat regulatory cells1,2,3,4. Further phenotypic description of these cells and comparison to other models of allotransplantation and other species could help to discriminate markers of great interest. Indeed, comparison of Bregs from mouse models of tolerance and operationally tolerant patients highlight predominance of CD5 or CD24 marker expression as biomarkers of Bregs3,23,24,42,43,44,45. In our model of tolerance induced by AdCD40Ig combined with CD8α depletion, CD24 is overexpressed compared to B cells lacking suppressive activity2. High throughput digital gene expression RNA sequencing recently emerged as an innovative tool to further characterize regulatory cells46. Finally, protocols to detect the presence of regulatory cells induced by a tolerogenic treatment can be adapted to other models. Here we used LEW.1W into LEW.1A combination of allograft, characterized by a graft rejection in about 7 days. The invert combination, which has been described as more stringent and where acute rejection happens faster and stronger, can be used. Autoimmune disease models can also benefit from our experience in transplantation for deciphering the mechanisms of tolerance induction with treatments. This work was realized in the context of the Labex IGO project (n°ANR-11-LABX-0016-01) which is part of the "Investissements d'Avenir" French Government program managed by the ANR (ANR-11-LABX-0016-01) and by the IHU-Cesti project funded also by the "Investissements d'Avenir" French Government program, managed by the French National Research Agency (ANR) (ANR-10-IBHU-005). The IHU-Cesti project is also supported by Nantes Métropole and Région Pays de la Loire. Red blood cell lysis solution Dilute 8,29g NH4Cl (Sigma, Saint-Louis, USA A-9434), 1g KHCO3 (Prolabo 26 733.292) and 37.2mg EDTA (Sigma, Saint-Louis, USA E5134) in 800ml H2O. Adjust pH to 7.2-7.4 and complete to 1L with H2O. Guillonneau, C., et al. CD40Ig treatment results in allograft acceptance mediated by CD8CD45RC T cells, IFN-gamma, and indoleamine 2,3-dioxygenase. J Clin Invest. 117, (4), 1096-1106 (2007). Bézie, S., et al. Compensatory Regulatory Networks between CD8 T, B, and Myeloid Cells in Organ Transplantation Tolerance. J Immunol. 195, (12), 5805-5815 (2015). Bézie, S., et al. Fibrinogen-Like Protein 2/Fibroleukin Induces Long-Term Allograft Survival in a Rat Model through Regulatory B Cells. PloS One. 10, (3), e0119686 (2015). Bézie, S., et al. IL-34 is a Treg-specific cytokine and mediates transplant tolerance. J Clin Invest. 125, (10), 3952-3964 (2015). Li, X. L., et al. Mechanism and localization of CD8 regulatory T cells in a heart transplant model of tolerance. J Immunol. 185, (2), 823-833 (2010). Guillonneau, C., Bézie, S., Anegon, I. Immunoregulatory properties of the cytokine IL-34. Cell Mol Life Sci. (2017). Nickeleit, V., Zeiler, M., Gudat, F., Thiel, G., Mihatsch, M. J. Detection of the complement degradation product C4d in renal allografts: diagnostic and therapeutic implications. J Am Soc Nephrol. 13, (1), 242-251 (2002). Chiffoleau, E., et al. Induction of donor-specific allograft tolerance by short-term treatment with LF15-0195 after transplantation. Evidence for a direct effect on T-cell differentiation. Am J Transplant. 2, (8), 745-757 (2002). Khattri, R., Cox, T., Yasayko, S. A., Ramsdell, F. An essential role for Scurfin in CD4+CD25+ T regulatory cells. Nat Immunol. 4, (4), 337-342 (2003). Liu, W., et al. CD127 expression inversely correlates with FoxP3 and suppressive function of human CD4+ T reg cells. J Exp Med. 203, (7), 1701-1711 (2006). Dai, Z., et al. Natural CD8+CD122+ T cells are more potent in suppression of allograft rejection than CD4+CD25+ regulatory T cells. Am J Transplant. 14, (1), 39-48 (2014). Guillonneau, C., Picarda, E., Anegon, I. CD8+ regulatory T cells in solid organ transplantation. Curr Opin Organ Transplant. 15, (6), 751-756 (2010). Kim, H. J., et al. Stable inhibitory activity of regulatory T cells requires the transcription factor Helios. Science. 350, (6258), 334-339 (2015). Manavalan, J. S., et al. Alloantigen specific CD8+CD28- FOXP3+ T suppressor cells induce ILT3+ ILT4+ tolerogenic endothelial cells, inhibiting alloreactivity. Int Immunol. 16, (8), 1055-1068 (2004). Picarda, E., et al. Transient antibody targeting of CD45RC induces transplant tolerance and potent antigen-specific regulatory T cells. JCI Insight. 2, (3), e90088 (2017). Ménoret, S., et al. 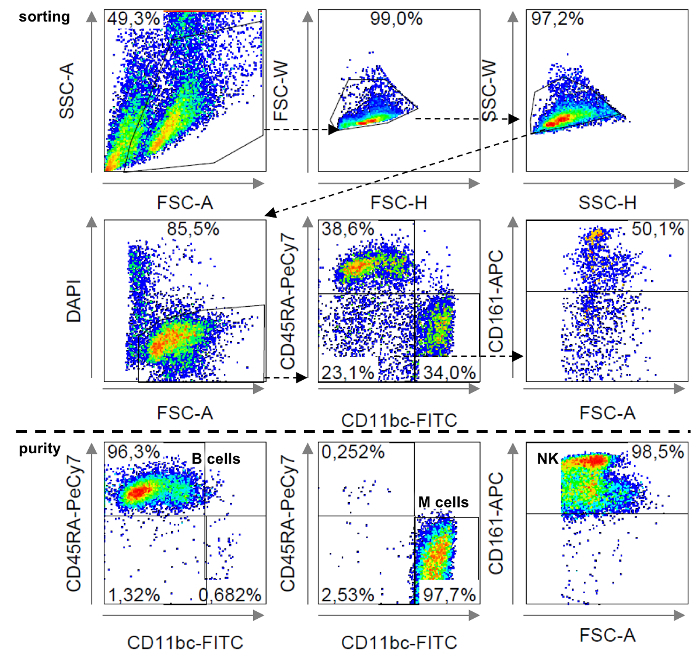 Phenotypic and functional characterization of CD8(+) T regulatory cells. Methods Mol Biol. 677, 63-83 (2011). Boor, P. P. C., et al. Human plasmacytoid dendritic cells induce CD8+ LAG-3+ Foxp3+ CTLA-4+ regulatory T cells that suppress allo-reactive memory T cells. Eur J Immunol. 41, (6), 1663-1674 (2011). Olson, B. M., Sullivan, J. A., Burlingham, W. J. Interleukin 35: a key mediator of suppression and the propagation of infectious tolerance. Front Immunol. 4, 315 (2013). Shimizu, J., Yamazaki, S., Takahashi, T., Ishida, Y., Sakaguchi, S. Stimulation of CD25(+)CD4(+) regulatory T cells through GITR breaks immunological self-tolerance. Nat Immunol. 3, (2), 135-142 (2002). Myers, L., Croft, M., Kwon, B. S., Mittler, R. S., Vella, A. T. Peptide-specific CD8 T regulatory cells use IFN-gamma to elaborate TGF-beta-based suppression. J Immunol. 174, (12), 7625-7632 (2005). Bouaziz, J. D., Le Buanec, H., Saussine, A., Bensussan, A., Bagot, M. IL-10 producing regulatory B cells in mice and humans: state of the art. Curr Mol Med. 12, (5), 519-527 (2012). Durand, J., Chiffoleau, E. B cells with regulatory properties in transplantation tolerance. World J Transplant. 5, (4), 196-208 (2015). Pallier, A., et al. Patients with drug-free long-term graft function display increased numbers of peripheral B cells with a memory and inhibitory phenotype. Kidney Int. 78, (5), 503-513 (2010). Guillonneau, C. Efficacy of Myeloid Derived Suppressor Cells on Transplant Survival. Transplantation. 99, (10), 2017-2019 (2015). Wood, K. J., Bushell, A., Hester, J. Regulatory immune cells in transplantation. Nat Rev Immunol. 12, (6), 417-430 (2012). Han, Y., et al. Pathogen-expanded CD11b+ invariant NKT cells feedback inhibit T cell proliferation via membrane-bound TGF-β1. J Autoimmun. 58, 21-35 (2015). Mesnard, L., et al. Invariant natural killer T cells and TGF-beta attenuate anti-GBM glomerulonephritis. J Am Soc Nephrol. 20, (6), 1282-1292 (2009). Mi, Q. S., Ly, D., Zucker, P., McGarry, M., Delovitch, T. L. Interleukin-4 but not interleukin-10 protects against spontaneous and recurrent type 1 diabetes by activated CD1d-restricted invariant natural killer T-cells. Diabetes. 53, (5), 1303-1310 (2004). Sharif, S., et al. Activation of natural killer T cells by alpha-galactosylceramide treatment prevents the onset and recurrence of autoimmune Type 1 diabetes. Nat Med. 7, (9), 1057-1062 (2001). Wermeling, F., Lind, S. M., Jordö, E. D., Cardell, S. L., Karlsson, M. C. I. Invariant NKT cells limit activation of autoreactive CD1d-positive B cells. J Exp Med. 207, (5), 943-952 (2010). Yang, S. H., et al. Sulfatide-reactive natural killer T cells abrogate ischemia-reperfusion injury. J Am Soc Nephrol. 22, (7), 1305-1314 (2011). Picarda, E., et al. MHC-derived allopeptide activates TCR-biased CD8+ Tregs and suppresses organ rejection. J Clin Invest. 124, (6), 2497-2512 (2014). Guillot, C., et al. Prolonged blockade of CD40-CD40 ligand interactions by gene transfer of CD40Ig results in long-term heart allograft survival and donor-specific hyporesponsiveness, but does not prevent chronic rejection. J Immunol. 168, (4), 1600-1609 (2002). Guillonneau, C., et al. Inhibition of chronic rejection and development of tolerogenic T cells after ICOS-ICOSL and CD40-CD40L co-stimulation blockade. Transplantation. 80, (4), 546-554 (2005). Guillonneau, C., et al. Anti-CD28 antibodies modify regulatory mechanisms and reinforce tolerance in CD40Ig-treated heart allograft recipients. J Immunol. 179, (12), 8164-8171 (2007). Qin, S., et al. "Infectious" transplantation tolerance. Science. 259, (5097), 974-977 (1993). Picarda, É, Ossart, J., Bézie, S., Guillonneau, C. Key role of allopeptide-specific CD8(+) Tregs in transplantation. Médecine Sci (Paris). 31, (1), 22-24 (2015). Chevalier, S., Lacroix, H., Moreau, J. F., Soulillou, J. P. Blood transfusion plus allograft--but not blood transfusion alone--induce IL 2-producing suppressor cells in Lew-1A recipients of LEW-1W heart allograft. Transplant Proc. 19, (1 Pt 1), 544-546 (1987). Fang, C., et al. Autoimmune responses against renal tissue proteins in long-term surviving allograft recipients. Transpl Int. 22, (11), 1091-1099 (2009). Yang, C. P., Bell, E. B. Persisting alloantigen prevents primed CD45RC- CD4 T cells from inducing allograft rejection: implications for immunological memory. Eur J Immunol. 29, (7), 2177-2186 (1999). Durand, J., et al. Regulatory B Cells with a Partial Defect in CD40 Signaling and Overexpressing Granzyme B Transfer Allograft Tolerance in Rodents. J Immunol. 195, (10), 5035-5044 (2015). Iwata, Y., et al. Characterization of a rare IL-10-competent B-cell subset in humans that parallels mouse regulatory B10 cells. Blood. 117, (2), 530-541 (2011). Guillonneau, C., David, L., Anegon, I. Improved Analyses of CD8+ T Cell Specificities Using Multimers of Peptide MHC Complexes Coupled to DNA Barcodes. Transplantation. 101, (2), 219-221 (2017).